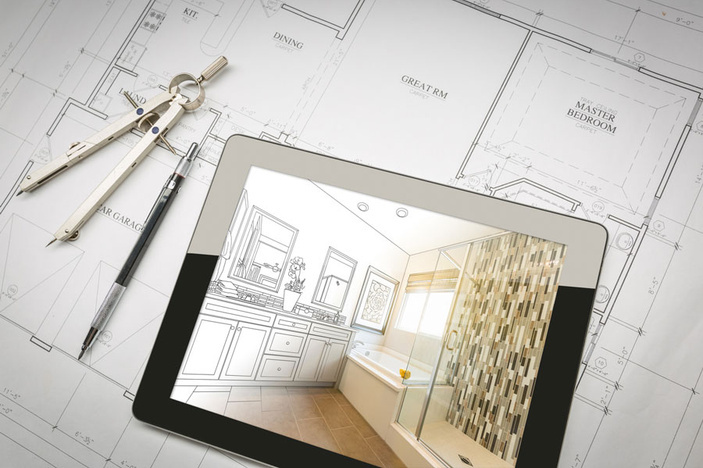 The best bathroom renovations begin with a plan. List your priorities by defining your exact needs. Any bathroom makeover requires serious thought and advance planning, especially when the budget is limited. Fortunately, economical and attractive bathroom renovations are entirely possible. Even a budget redo can look like a million bucks with just a few creative touches. Here are a few tips to get your next renovation project started right. It all starts with a plan. Begin by defining your exact needs. Newer water-saving fixtures and faucets, a more efficient layout, improved lighting, and more attractive surroundings are all good reasons for planning a home improvement project. Because a bathroom is a relatively small area that receives a lot of use on a daily basis, it stands to reason that making it work better for family needs is desirable. If your space is crowded and inefficient, focus on the floor plan and the function. Don't neglect the need for adequate storage: Wall-hung cabinets are one solution, but also consider open shelving or slim, freestanding bookshelves to increase available space. Low-water-use toilets are mandated by code in most areas, but if your budget allows, you might look at dual-flush options to save even more water without sacrificing modern convenience. The same is true of low-flow faucets and shower heads: Shop for options that provide even greater flexibility and control. Sensor-activated faucets are modern and effective for households with young children who don't yet grasp conservation concepts. They are also highly efficient for anyone who has difficulty with faucet handles and shower controls. Grooming needs are as important to a bathroom as bathing needs. Proper lighting is a major factor. Every bathroom should have a balance between ambient lighting and special-needs illumination. If you're remodeling, installing a light over the tub or in the shower enclosure will add value. Placing lighting on either side of a vanity mirror is much better for grooming needs than a single fixture located above the mirror. Also, consider safety and convenience: A nightlight is great for children and guests, but a low-voltage rope light along the vanity toe kick can be a style feature as well. Even budget bathrooms can be made to feel like stress-free retreats. The mood stems from color, light, textural materials, and pampering amenities rather than expensive fixtures. No matter your decor tastes, whether ultra-modern, Euro-tech, down-home country, or ranch-style rustic, contractors in Marble Falls and the Highland Lakes are available to assist you with a bathroom update that will fit your needs to a T. You can find everything you need for a DIY cosmetic touchup or a full-blown renovation right here in the Highland Lakes Home Improvement & Construction Guide. Collect some of your ideas then give one of the contractors in this guide a call. Your better bathroom is on the way.